Agnes has found a skull which appears to be that of a cow, but she’s convinced herself that it is a fossil and is therefore the skull of a cow dinosaur. Today, under continual questioning from a dubious Trout, she plays the traditional card of the clearly-wrong: A claim of expertise. Where else have you heard someone with no clue to what they’re doing insist, “I know more about this than anybody, believe me”? Proving that it is becoming increasingly difficult to parody the world around us. 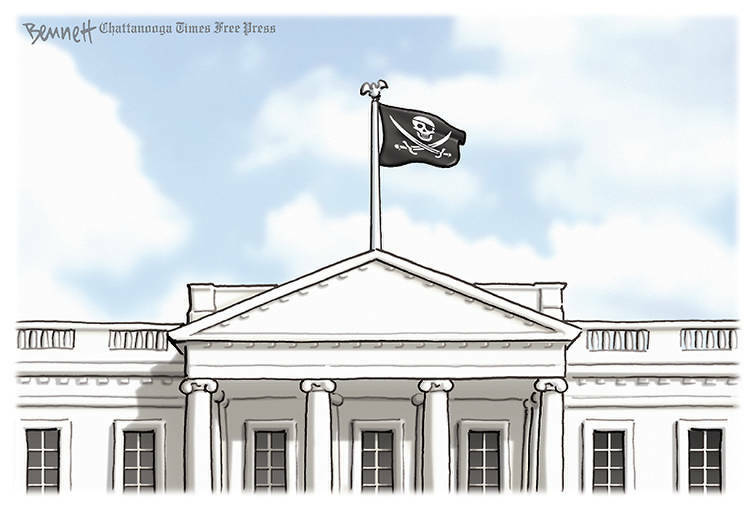 Clay Bennett uses simplicity to show where we are, a land in which the President, sworn to uphold the Constitution, has ordered officers at the border to ignore the law and courts, and who wants to override the First Amendment and who, in sum, is apparently unclear on whether he was elected President or Emperor. The challenge for cartoonists and comedians alike is that the best parodies are comic restatements of situations which aren’t the least bit funny. Scott Stantis is not the only cartoonist to point out that reinstating family separation — in open defiance of court orders — is ratcheting up the level of ungodly cruelty, but he is perhaps the most stark and direct, at a moment where cleverness is an unnecessary bit of added ribbon. Someone asked the other day what cartoonists I consider “conservative” and I mentioned Stantis, with whom I often disagree but who does not stoop to recirculating unfounded propaganda, and, if he is too trusting of authority, is then twice as furious when authority proves reprehensible. QED, and particularly so in light of the rightwingers who are avoiding the obvious anti-democratic, unconstitutional excesses in the current news. 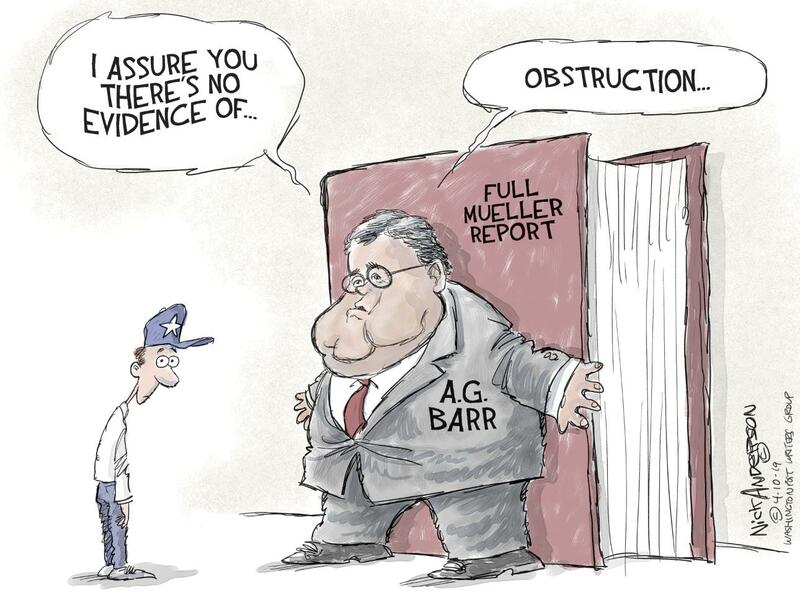 Not only do they assume evidence Barr has not released, but they are dutifully ignoring the fact that even Barr could not whitewash Mueller’s point that there is in the report, whether or not Congress chooses to act upon it, evidence of obstruction. 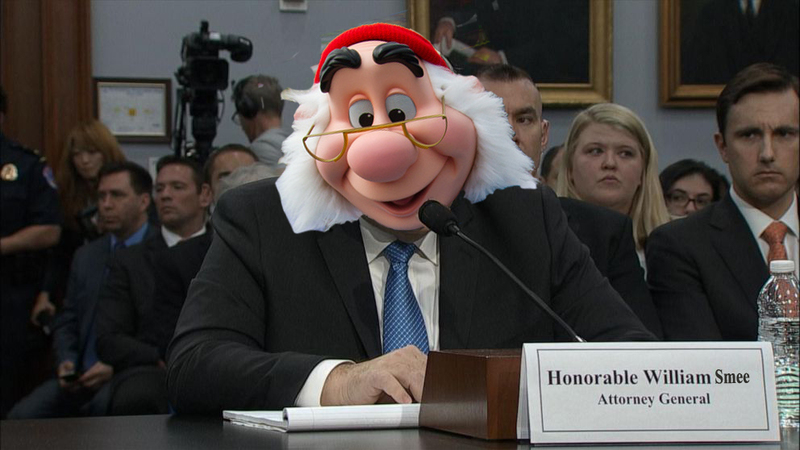 Though, as Nick Anderson points out, Barr does not suffer from lack of effort. 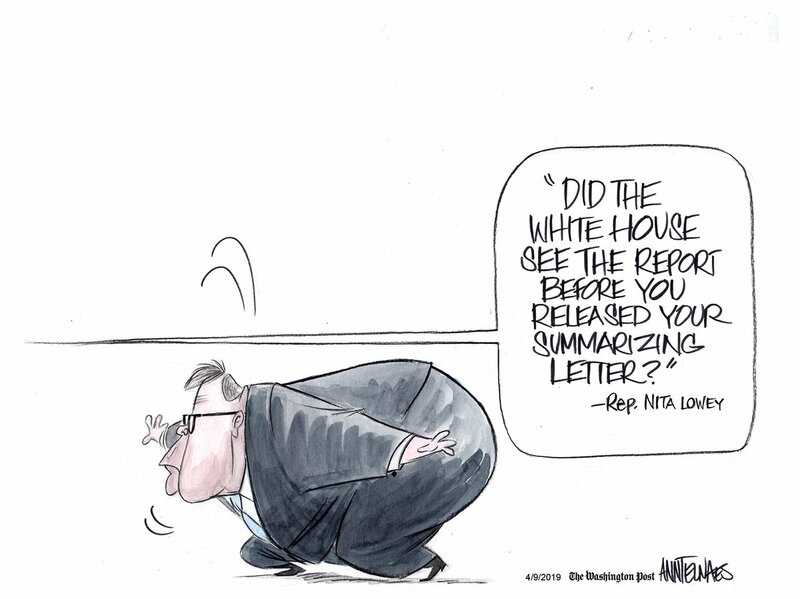 Nor, as Ann Telnaes suggests, for lack of lawyerly skill. A worthy executive officer, indeed, to our Pirate King. 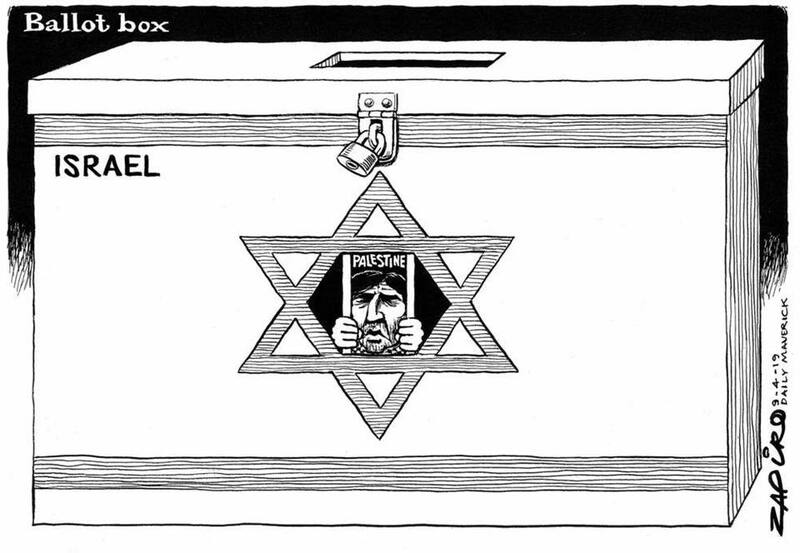 As I write this at 8 am Eastern, CNN has projected Netanyahu the winner in Israel’s election, but Zapiro had already drawn the outcome earlier. Two points: One is that Zapiro’s actual name is Jonathan Shapiro so I suppose the rightwing snowflakes will have to dub him “self-hating” since it’s harder to simply declare him Antisemitic. There being no other explanation for his suggestion that a platform of ignoring international law and making permanent and official Israel’s occupation of the Golan Heights and West Bank is unfair to a significant share of its occupants, whom Netanyahu previously declared should not be entitled to vote, even if they lived in Israel, because of their religion. One does wonder if Dear Leader’s cheerful move of our embassy to Jerusalem emboldened Bibi to make that extremist pledge and to adopt that extremist stance. However, only the most naive mooncalves will expect those same wounded souls who attacked Rep. Omar for suggesting American Jews have a duel loyalty to also criticize Trump for referring to Netanyahu as “your prime minister” in addressing American citizens at the Republican Jewish Coalition. And the tweeted excerpts of his speech on that link should make sensible people tremble. Which leads us to the second point: If you have been complaining about the Electoral College, you may take some comfort in not living under a parliamentary system, because Netanyahu’s victory is not a complete win. It’s simply a chance for him to take power by making common cause with small, rightwing parties that are even more extreme than Likud. “The right-wing bloc led by the Likud won a clear victory. I thank the citizens of Israel for the trust. I will start forming a right-wing government with our natural partners as soon as tonight,” Netanyahu said. At least Trump’s “natural partners” — with the exception of Steven Miller — are forced to confine their influence to social media. It does make me wonder if our notoriously uninformed leader knows that Israel is an undeclared nuclear power, and if knowing that would have made him any less eager to antagonize Iran by needlessly and foolishly declaring their Revolutionary Guard a terrorist organization? And what the world is going to look like by November, 2020? This oldie has aged way too well. Stantis has considerably more conscience than any other conservative (in his case right-libertarian) cartoonist ever manages to muster. And yet, in today’s Prickly City, he’s still smugly dispensing Trump bromides as if they were argument stoppers. The urge to return to the feed trough is indeed strong in these. Yes, Prickly City has longer deadlines that force him to deal in generalities, while the basic setup encourages — often forces — the characters to mouth those bromides. It debuted in less fraught times as the non-brain-damaged conservative alternative to Mallard Fillmore, but I’m not sure the current market allows much room for nuance, though Candorville seems to be able to maintain a bit of reasonable perspective over on the other side of the aisle. I’d compare Prickly City more to La Cucaracha in that right/left sense, and I don’t think Lalo Alcaraz has a lot of interest in nuance, so it’s probably a fair comparison. Both are still less gratingly fundamentalist than Mallard Fillmore or Matt Bors. 28 queries in 0.178 seconds.